WP Smackdown is made possible by advertising & affiliate revenue. Eventually, we plan to offer video courses, sell ebooks, and possibly go down the membership route to offer up paid content. But for now, affiliates help keep us in the business of writing great content. The FTC is very clear on disclosing the relationship that people & businesses have with affiliates, especially when it comes to writing reviews and/or recommending products (both of which we do on this site). In addition to abiding by the rules that the FTC has put in place, we want to be completely transparent & honest with our readers. With that being said, you might see an affiliate disclosure statement at the top of some articles. Should we use the same language on every page, or modify the disclosure based on the article content? If the FTC changes their rules, or we decide to change the disclosure, how easy will it be to update everywhere? How do we honestly & obviously display a disclosure without it getting in the way of our actual content? How can we say what we need to say… keep it short… and still provide the full details behind our relationship with affiliates? What tool(s) should we use to implement our disclosure? Now that we have the field showing on our post edit screen, we have the option to check Yes. Now we need to tell our template to output some markup if Yes is selected. We added the following code to our single.php template, just before the call to the_content(). 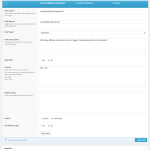 The $affiliate_disclaimer variable can be set to whatever you want. Just make sure you use the same variable within the if() statement. Here’s what our affiliate disclosure looks like. Because we wanted to include more information, but not get in the way of the article’s main content, we added a “Learn More” link. We used CSS to only show this link when the user seemed interested in the disclosure (by hovering over it). 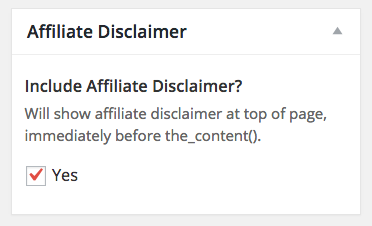 If you’re not using an affiliate disclosure statement on affiliate articles, I highly recommend you do so. As affiliate marketing becomes more and more popular, the FTC is cracking down on publishers who aren’t following their guidelines. Are you using a plugin to display your affiliate disclosure statement, or did you opt for the non-plugin route? Please share your ideas & setup in the comments. 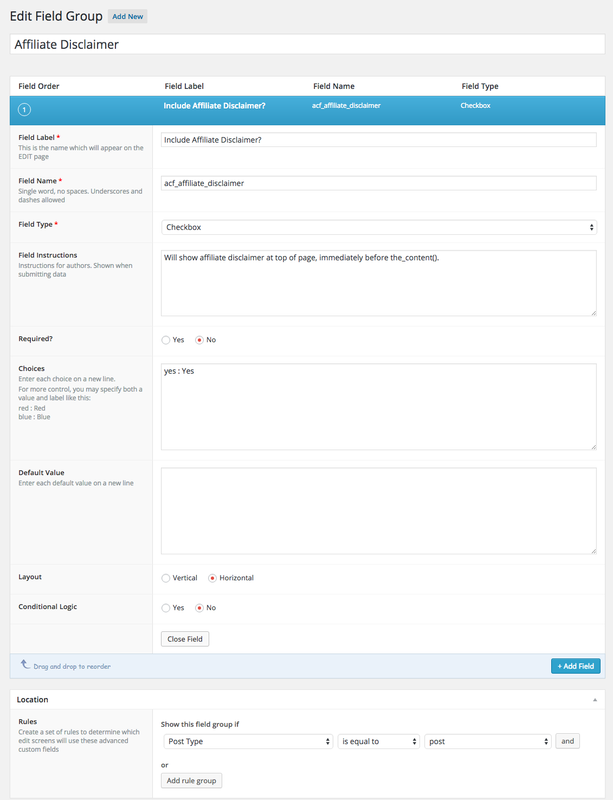 9 Commentson "Add an Affiliate Disclosure Statement without a Plugin (using Advanced Custom Fields)"
Great article and solution – it got me about 90% to where I want to be. However, can you add any insight on how you created your formatting with CSS? Thanks! Hi Angela — Sure. I’d be happy to. I added a class of “disclaimer” to the <p> tag, and then I applied CSS styles to that class in my stylesheet. Please let me know if that answers your question, or if you need any further help. Thank you so much for the followup! That was exactly the help I needed. :) You rock! Good tips, thank you. I had an error when I tried to implement this though. This way, I was creating a TRUE/FALSE in $affiliate_disclaimer and doing a simple if statement. Thanks for chiming in, Karl. I’m not sure why I’m able to get it to work and you were getting an error, but I’m glad you figured it out. And thanks for sharing your solution for others who might run into the same issue. Hi, Karl! Can you please copy paste the whole code you used? I have the same problem, but can’t figure it out. Thanks a lot! Violet. I have followed step 1 to a T. I am struggling on step 2, specifically, adding code to the single.php template, just before the call to the_content(). Where do I find the single.php template? 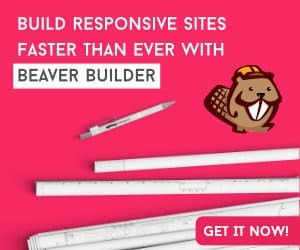 I’m new to WordPress, so forgive me if this is a novice question! Ok, I found it in Appearance -> Editor. I wasn’t sure where to paste the code. I put it just after the header and before a section of code that contained the word content. I then went to a draft post, checked the box to indicate “yes” and typed in a few words for the draft. When I previewed the post the disclaimer was not there. I also tried adding the disclaimer to a previously published post. No success. Nice detective work finding single.php. That is the correct file. I’m guessing there’s a small error in the code somewhere. Can you send me the code you’re using? Copy/Paste it from the file and email it to [email protected]. Also, if you could include a screenshot of some of the code before & after it, that will help me see if it’s in the right place.